Theodosia and the Last Pharaoh by R.L. LaFevers. Review: Welcome to the magical, sensational, and extraordinary world of Theodosia and the Last Pharaoh created by R.L. LaFevers. Theodosia is a smart, determined, curious, and powerful eleven year old girl who will take you on a journey like no other. When the Serpents of Chaos are up to no good Theodosia must stop them in this amazing fast-paced book. The story takes place in Luxor, Egypt during the 21st century. Theodosia (the main-character), is an eleven year-old girl with unusual powers who must return the greatly powerful artifacts: the Emerald Tablet and The Orb of Ra to a secretive group named the wedjadeen. The wedjadeen are very dedicated to protecting magic and ancient, powerful artifacts. Theo must return the artifacts safely and quickly, before the Serpents of Chaos get a hold of them. She also must find Major Grindle, Theo's contact at the Luxor who is part of the Brotherhood of the Chosen Keepers. They are a group devoted to stopping the Serpents of Chaos. During her stay in Egypt she finds out a lot about her family and about her closest friend in Egypt. Besides, returning the artifacts she must help her mother during her archaeological expedition. Then suddenly the people closest to her disappear. This book is just spectacular. I have many great things to say about this book so I'm going to start with the plot of the story. The beginning got me right into the book which I loved since in other books it takes me at least two to three chapters to actually get into the book. The rising action and climax were really fast-paced and suspenseful, especially when one of Theo's friend and a member of her family disappear. Also, the cliff-hangers at the end of each chapter made me read on and on. The last thing that I have to say about the plot is that it had a very satisfying ending which very much pleased me. The plot practically engulfed my mind and wouldn't let me go. The next thing that I want to talk about is the characters in the story. Theodosia is a round and dynamic character. You can easily describe her personality by her actions, which I think that is another good thing that the author did. Theodosia changes in the end by giving away her secrets to her parents as well as viewing herself differently. Theodosia's mom has the following character traits: caring, determined, and a little selfish. Gadji (another one of the characters) also has the following traits: he has a sense of responsibility, he is non-selfish, gentle, he is curious, he also grateful for whatever he gets, and he is very experienced. The only way I could have come up with these traits is if the author indirectly characterized his characters in which he did. The characters are also very well-developed. You also can definitely relate to these characters because many kids these days are very curious and Theodosia is curious, so there is your relationship. My last words on the characters is that they are very interesting in which it helps me understand why they did what they did. The authors writing style was another thing that I liked. He had a lot of descriptive language and the story was full of action. The last thing I want talk about is the setting. The setting was definitely integral and not backdrop. The setting also helps create an image in my mind, which I would like in all books. All in all I would rate this book a 4.5 out of 5 stars since it is not my favorite book but it is certainly not my least favorite book. I also would say that this book would be enjoyed by kids ages 10 through 13. Theodosia and the Last Pharaoh has been one of my favorite books ever. This is a must read that many will love. I personally guarantee that you will love this book. Have fun reading! We would like to thank Houghton Mifflin Harcourt for providing a copy of Theodosia and the Last Pharaoh for this review. 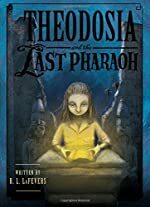 Have you read Theodosia and the Last Pharaoh? How would you rate it?